You might think winter is the only season that poses a real threat to your roof; given that ice dams and roof leakage are a constant problem for homes here in snowy Michigan. However, that’s not the case. The summer weather can be just as brutal to your roof, if not more, even when there is no ice in sight. The most significant dangers to your roof that are common to summer weather patterns are high winds, sudden downpours, hail, and sun. To better understand these threats, read on. Did you know that the National Centers for Environmental Information (NOAA) estimates $1 billion in hail damage to property each year? That is a massive amount of damage from only one specific type of weather. If you have ever been in a hailstorm, you will know why. Michigan doesn’t get as much hail as other parts of the country. However, that makes a hailstorm that much more damaging here when we do get it. 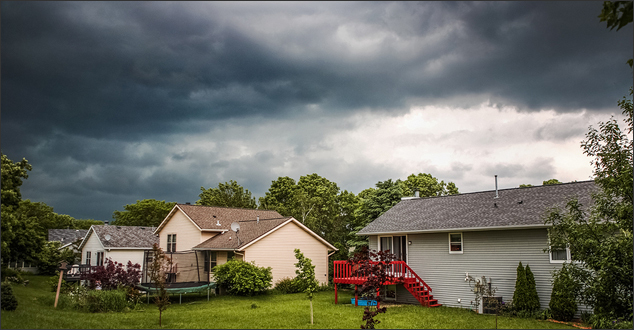 We do get our fair share of high winds and sudden downpours, which also pose potential threats to your roof. We have had a few windstorms in the last couple of years here in Michigan. They left the whole state with power outages that lasted for a week or more. So you can bet they did some real damage to a number of roofs. Your roof has to be constructed to re-direct the force of the wind down the walls and to the ground. Otherwise, a high-speed stiff wind can literally tear the roof off of your house. Wind can also knock in the gables, which are the side walls of your roof. Luckily most contractors know this. However, it’s always a good idea to prepare by having a contractor inspect your sheathing – which is the wood nailed to your rafters. If this underlayer isn’t properly installed, you are looking at trouble. Have your contractor inspect from the attic side as well. If you’re curious, he can also tell you what kinds of sheathing best prepare you for high winds in your area. It is also essential to take the advice of a professional and locally-known roofing contractor after a storm. Unfortunately, it is common for homeowners to experience roofing contractor fraud during storm season. Another good thing to ask about during an inspection is your moisture barrier. You can have a secondary moisture barrier installed with a new roof for extra protection. However, the most significant threat a sudden downpour poses is to your gutter system if it isn’t properly cleaned out. Have you done your spring gutter cleaning? You may not realize how much spring debris has accumulated in there with all the seeds and dead leaves spring produces. If your gutters are clogged, there is nowhere for the water to go and it will find a way under your shingles and into your house. Not only do UV rays break down your roof in any weather – rain or shine – but the heat from the sun is baking those shingles day in and day out. Over time, the sun bakes and dries out your shingles no matter how great they started out. Once shingles are no longer weather-proofed and flexible, they quickly crumble and expose your roof to all kinds of damage. In Michigan, we get extremes of temperature from week to week. Sometimes the temperatures fluctuate from day to day. This has a significant effect on your roof. Your roof has to expand and contract with the change in temperature, and it causes movement. The movement will eventually loosen the bonds of your flashing, your drainage system, and on the shingles themselves. It is important to keep up maintenance and to get regular inspections in the summer months. Don’t assume, just because there is no ice and snow, that your roof can take care of itself. If you live in Southeast Michigan, please give us a call. We are here whenever you need us.